The Knee Injury and Osteoarthritis Outcome Score (KOOS) is a knee-specific instrument, developed to assess the patients' opinion about their knee and associated problems. The KOOS evaluates both short-term and long-term consequences of knee injury. 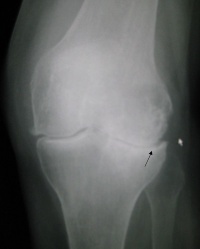 It holds 42 items in 5 separately scored subscales; Pain, other Symptoms, Function in daily living (ADL), Function in Sport and Recreation (Sport/Rec), and knee-related Quality of Life (QOL).It is an extension of the WOMAC Osteoarthritis Index.The Knee injury and Osteoarthritis Outcome Score (KOOS) is self-administered.The KOOS proved reliable, responsive to surgery and physical therapy, and valid for patients undergoing anterior cruciate ligament reconstruction. The KOOS meets basic criteria of outcome measures and can be used to evaluate the course of knee injury and treatment outcomes. The KOOS has been validated in several different populations having surgical procedures due to knee complaints. To ensure the instrument being valid for both short-term and long-term consequences, validations have been carried out in different populations with varying diseases and durations and at varying ages and activity levels. Firstly, the American-English version was validated in subjects (age range 18–46) undergoing surgical reconstruction of the ACL.Secondly, the Swedish version was validated in subjects (age range 16–79) undergoing knee arthroscopy.. Thirdly, the KOOS was compared to the WOMAC in subjects meniscectomized 16 years previously (age range 38–76) with and without OA. Fourthly, a validation study was carried out in subjects (age range 43–86) treated with total knee replacement for OA. For patients on the waiting-list for total knee replacement for OA, content validity was assessed before surgery by asking the patients to rate the importance of improvement in each of the five KOOS subscales on a 5-point Likert-scale as extremely important, very important, moderately important, somewhat important, or not important at all. For each subscale examples of questions within the subscale were given. Over 90% reported that improvement in the four subscales Pain, Symptoms, Activities of Daily Living, and knee-related Quality of Life was extremely or very important when deciding to have their knee operated on. 51% reported that improvement in functions included in the subscale Sport and Recreation Function such as squatting, kneeling, jumping, turning/twisting and running was extremely or very important when deciding to have their knee operated on. Postoperatively, patients tended to start doing physical functions they did not do prior to the operation. Inclusion of two different subscales of physical function relating to daily life, and sport and recreation. This enhances the instrument’s validity for patients with a wide range of current and expected physical activity levels. Assess changes from week to week induced by treatment (medication, operation, physical therapy) or over years following a primary injury or OA. Used in research to assess groups and to monitor individuals. A Likert scale is used and all items have five possible answer options scored from 0 (No Problems) to 4 (Extreme Problems) and each of the five scores is calculated as the sum of the items included. Scores are transformed to a 0–100 scale, with zero representing extreme knee problems and 100 representing no knee problems as common in orthopaedic assessment scales and generic measures. Scores between 0 and 100 represent the percentage of total possible score achieved. An aggregate score is not calculated since it is regarded desirable to analyze and interpret the five dimensions separately. The score is a percentage score from 0 to 100, 0 representing extreme problems and 100 representing no problems. This direction, 100 indicating no problems, is common in orthopaedic instruments and generic measures like the SF-36. In measures developed by rheumatologists, like the WOMAC, 100 usually represents worst possible result. ↑ 1.0 1.1 1.2 Roos EM, Lohmander LS. Knee injury and Osteoarthritis Outcome Score (KOOS): from joint injury to osteoarthritis. Health Qual Life Outcomes 2003;1:64. ↑ Roos EM1, Roos HP, Lohmander LS, Ekdahl C, Beynnon BD.Knee Injury and Osteoarthritis Outcome Score (KOOS)--development of a self-administered outcome measure.J Orthop Sports Phys Ther. 1998 Aug;28(2):88-96. ↑ Rodriguez-Merchan EC. Knee instruments and rating scales designed to measure outcomes. Journal of orthopaedics and traumatology : official journal of the Italian Society of Orthopaedics and Traumatology 2012;13:1-6. ↑ Collins NJ, Misra D, Felson DT, Crossley KM, Roos EM. Measures of knee function: International Knee Documentation Committee (IKDC) Subjective Knee Evaluation Form, Knee Injury and Osteoarthritis Outcome Score (KOOS), Knee Injury and Osteoarthritis Outcome Score Physical Function Short Form (KOOS-PS), Knee Outcome Survey Activities of Daily Living Scale (KOS-ADL), Lysholm Knee Scoring Scale, Oxford Knee Score (OKS), Western Ontario and McMaster Universities Osteoarthritis Index (WOMAC), Activity Rating Scale (ARS), and Tegner Activity Score (TAS). Arthritis care & research 2011;63 Suppl 11:S208-28. ↑ Alviar MJ, Olver J, Brand C, Hale T, Khan F. Do patient-reported outcome measures used in assessing outcomes in rehabilitation after hip and knee arthroplasty capture issues relevant to patients? Results of a systematic review and ICF linking process. Journal of rehabilitation medicine : official journal of the UEMS European Board of Physical and Rehabilitation Medicine 2011;43:374-81. ↑ Roos EM, Roos HP, Lohmander LS, Ekdahl C, Beynnon BD: Knee Injury and Osteoarthritis Outcome Score (KOOS)--development of a self-administered outcome measure. J Orthop Sports Phys Ther 1998, 28:88-96. ↑ Roos EM, Toksvig-Larsen S: Knee injury and Osteoarthritis Outcome Score (KOOS) - validation and comparison to the WOMAC in total knee replacement.Health Qual Life Outcomes 2003, 1:17. ↑ Tegner Y, Lysholm J: Rating systems in the evaluation of knee ligament injuries.Clin Orthop 1985, 43-49.